Shoei RF-1200 Review & Tests 2019 - Pros Cons - Is It Worth The Money? Japanese helmet maker Shoei needs no introduction. They have been one of the top helmet manufacturers for a long time now, producing high-quality helmets and raising the bar with each new model. Each and every helmet they put out is highly anticipated and needs to meet the extremely high standards of their demanding customer base these days. Riders including myself have been spoiled by Shoei in the past and as a result we expect nothing but the best in their new offerings. This certainly does put some pressure on the company, as they constantly need to improve and tweak their products in order to meet the expectations. It is pretty hard to improve on great but they have to do that somewhat consistently with every new generation of helmet. With Shoei, you will always pay top dollar but it’s typically worth every penny as you generally know in advance what you are going to get. No unpleasant surprises here. If you think they aren’t exactly affordable, take a moment to think about it. Apart from that old cliche that you cannot put a price on your own safety, the fact that it costs a mere fraction compared to what you would spend on a bike is reason enough for you to save up your hard earned coins. Shoei’s RF-series full-face helmets follow that same guideline set by the company. Ever since the ‘80s, the RF has been their most popular series and all new generations have continued the legacy set by previous models. In this article I’m going to give my impressions of their latest offering, the RF-1200. Arriving as a successor to the excellent RF-1100, the RF-1200 has some big shoes to fill. Both models look roughly the same, but the first difference I spotted was when I picked it up as the RF-1200 is much lighter and a little more compact than the RF-1100. This is good news for those who ride for long periods of time, or if you have an aggressive riding style. A lighter helmet causes less fatigue for the rider, and allows for the more natural movement of the head and neck. Moreover, the RF-1200 is the lightest Shoei helmet on the market that meets the Snell safety certification. Now, it’s no secret that Shoei uses the best materials in order to make their helmets as strong and durable as possible and the RF-1200 feels as if it’s carved out from a single piece of plastic. The paint and the finish are simply top notch and Shoei has provided you with a wide variety of graphics and colors to choose from. I counted a total of 22 choices of solids and graphics so there is something for everybody! It also comes in four sizes – XS, M, L, and XL. So far, so good, everything is outstanding, as we have come to expect. Shoei RF-1200 closeBreaking the barrier between the interior and the exterior are the air vents. Seeing as this is a brand new model, some of you may be expecting ventilation to be at least as good or better, than that of recent Shoei GT Air which is an incredible helmet. Unfortunately, it fails in that department but let’s face it the GT Air has one of the most effective ventilation systems you can buy today. The RF-1200 has four rear vents, same as RF-1100, two of which are can be closed, and in front Shoei has added a new brow vent opening, in addition to a chin vent (though it’s inadequate in my opinion). Both front vents have three adjustable positions: open, half-open, and closed, so you can adjust the airflow just the way you like it. I’ll cut to the chase and say that the ventilation on the RF-1200 is pretty damn good and blows many helmets away. Still, it’s not the best I’ve seen. The RF-1200 interior is lined with 3D Max Dry System II, designed by Shoei, which is twice as efficient in dealing with excess moisture when compared to the more popular nylon that is used on most helmet interiors. It fits the head and the face nicely, and I found that the comfort never dropped significantly, even after long or aggressive rides. The noise levels are pretty low, adding to the already outstanding comfort. There was some noticeable noise with the top vents open but this is to be expected. I will say that the noise levels on the GT Air are quieter in every respect. So, good but not great in the noise department. Emergency quick release cheek pads are standard issue on the RF-1200, which allows medical technicians and emergency personnel to remove your helmet more easily, without causing further head and neck trauma. Needless to say, this useful feature will hopefully remain unused. The materials used are top quality, as is always the case with Shoei, and the lining is completely removable, washable and hypoallergenic. Shoei developed a brand new base-plate, named the QR-E, and a CWR-1 face shield for this particular model. It has double gaskets around the eye port, along with the horizontal ribs along the top and bottom edges which provide the extra rigidity, which doesn’t allow for much flexing, making the shield open and close tightly. In addition to this, you can fully adjust how tight the shield rests against the eye port, by operating a 5 step adjustment screw. Shoei RF-1200 shieldThe CWR-1 is also free of optical distortion, thanks to the special molding process developed by Shoei. The visibility out of the eye port is above average on both horizontal and vertical planes, making the helmet easy to see out of, and this adds to the more natural feel of the ride, because you don’t need to twist your neck around to see the things you would normally be able to see if you weren’t wearing a helmet. The RF-1200 doesn’t have an integrated sun visor (the GT Air does), but it does come with a Pinlock anti-fog insert, which I didn’t install since there was no fogging. Overall I found the quality of the shield to be pretty damn good but note it does not sport the VESC-8 spec like the GT Air does. 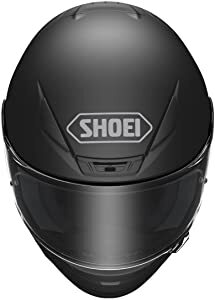 I know many of you existing Shoei fans will be comparing this model to the predecessor the RF-1200. In my opinion the RF-1200 is clearly better but not by a long way. With a lightweight and significantly smaller design, the new RF-1200 still manages to provide a powerful shell design, covering your entire head and offering full frontal, back and sideways protection. The helmet comes in four different shell sizes to provide the perfect matching and custom fit, no matter the dimensions of your head. Another important feature of this Shoei helmet is that it allows fewer noises to enter the helmet and thus disturbing you while driving. But even though noise diminishing works at high intensity, you will still be able to clearly hear all rode noises to ensure the perfect driving. Shoei also invested in a superior ventilation system, featuring 5 different vents to provide perfect ventilation and a higher intake of oxygen even when riding at high speeds. The cheek pads also come in various thickness levels to ensure the most customized fit according to your needs and requirements. The inner liner is made from high-end materials such as the Max-Dry system which allows quickly absorbing features to easily eliminate sweat and keep your head and hair dry even at harsh temperatures. In addition, the new RF-1200 from Shoei comes with a built-in emergency quick releasing system allowing for the cheek pads to be easily removed in cases of medical emergencies and injuries. Last but not least, the shield is also improved to increase rigidity and not allowing the wind pressure to bend it in time. The shield can easily block most harmful UV rays without diminishing the quality of your vision. The Shoei RF-1200 is, without a doubt, a superb full-face helmet. I’ll go on record here and say that it is inferior to the slightly more expensive Shoei GT Air in most every department. That said, it is still a superb helmet with outstanding fit and finish and it does carry the Snell rating whereas the GT Air does not. Decide how important that is to you. When it comes to extreme sports, safety is crucial because it can actually make the difference between living and dying. Accidents amongst motorcyclists are quite frequent, mainly because of the road conditions and speed. And while most of them cannot be avoided, their impact could at least lower. Wearing the right head protection in the form of a full helmet is extremely important, especially in speed sports like riding your motorcycle. So what better way to protect your life by not purchasing the right helmet? With over 50 years of experience, tradition and professionalism, the Japanese producer of helmet, Shoei, is one of the most respected brands in the branch. Thus, purchasing the new Shoei RF-1200 full face helmet in matte black is a good idea if you enjoy riding your motorcycle but still want to feel safe, even at high speeds. If you are looking for safety when riding your powerful motorcycle, you can never go wrong with the new Shoei RF-1200 full helmet. Although the price may seem a bit high, this helmet will become your most powerful and trendy accessory on all weather and humidity conditions, while offering the best protection. Click Here To Check Out Current Deal On Amazon! Quietest Motorcycle Helmet Copyright © 2019.